Need a divisibility rule chart to remember them all? Click and use ours as well as our many worksheets. 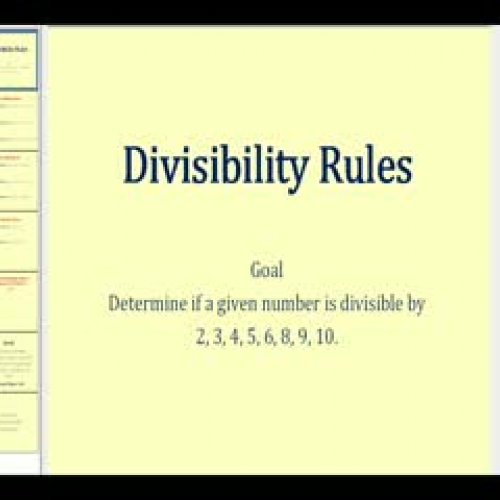 Divisibility Rule of 2 The last digit or the unit digit is even (0,2,4,6,8). Divisibility Rule of 3 The sum of the digits is divisible by 3. Divisibility Rule of 4 The last two digits are divisible by 4. Divisibility Rule of 5 The unit digit or last digit is 0 or 5. Divisibility Rule of 7 The last digit is multiplied by 2 and subtracted from the rest of the number. The result is either 0 or divisible by 7. Divisibility Rule of 8 The last three digits are divisible by 8. Divisibility Rule of 9 The sum of the digits is divisible by 9. Divisibility Rule of 11 The sum of the even digits is subtracted from the sum of the odd digits. The result is either 0 or divisible by 11. Divisibility Rule of 12 Number divisible by both 3 and 4. The divisibility rule for number 2 assists in determining whether a number is divisible by 2. The last digit or the unit digit is even (0,2,4,6,8). The unit digit is 2. 2 is an even number. The divisibility rule for number 3 assists in determining whether a number is divisible by 3. The sum of the digits is divisible by 3. The number can be divided by 3. The divisibility rule for number 4 assists in determining whether a number is exactly divisible by 4. The sum of the digits is divisible by 4. The numbers can be divided by 4. The divisibility rule for number assists in determining whether a number is exactly divisible by 5. The unit digit or last digit is 0 or 5. The unit digit is 5. It is satisfied by the divisibility rule of 5. The numbers can be divided by 5. The divisibility rule for number 6 assists in determining whether a number is exactly divisible by 6. Number divisible by both 2 and 3. The number can be divided by 6. The divisibility rule for number 7 assists in determining whether a number is exactly divisible by 7. The last digit is multiplied by 2 and subtracted from the rest of the number. The result is either 0 or divisible by 7. The number can be divided by 7. The divisibility rule for number 8 assists in determining whether a number is exactly divisible by 8. The last three digits are divisible by 8. The numbers can be divided by 8. The divisibility rule for number 9 assists in determining whether a number is exactly divisible by 9. The sum of the digits is divisible by 9. The numbers can be divided by 9. The divisibility rule for number 10 assists in determining whether a number is exactly divisible by 10. The unit digit is zero. The unit digit is 0. It satisfies the divisible rule of 10. The divisibility rule for number 11 assists in determining whether a number is exactly divisible by 11. The sum of the even digits is subtracted from the sum of the odd digits. The result is either 0 or divisible by 11. The numbers can be divided by 11. The divisibility rule for number 12 assists in determining whether a number is exactly divisible by 12. Number divisible by both 3 and 4. The numbers can be divided by 12.